Here in New Jersey we are experiencing a boat load of rain. Last I heard on the news, for our area, we are over a few inches above last year’s total at this same time. Last year’s total rainfall at this time were normal measurements. As Luke Bryan sings, Rain is a Good Thing. However, too much rain, is not a good thing for your vegetable plants. Good drainage in your vegetable garden beds can prevent the most obvious issue which is root rot. Root rot is a disease that can occur in vegetable plants both indoors and outdoors, which is the decaying of a vegetable plants’ roots. 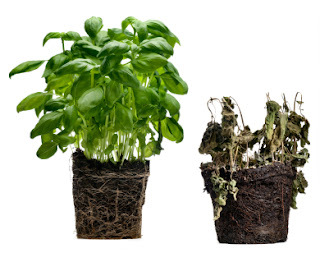 Root rot will occur when the roots of your vegetable plants get too wet, which creates a perfect environment for various fungi that carry out this process. As stated earlier, making sure the area where your vegetable plants reside has adequate drainage is a major key in preventing root rot. There a few solutions you can implement to prevent excess water around your vegetable plants’ roots. For vegetable plants that you are growing indoors, let’s start with the obvious. Make sure that whatever your vegetable plants are planted in have enough drainage holes. You may have purchased a pot (or pots) from a home or garden center and think that it may have enough holes, but that is not always the case. Do not be afraid to drill a few more in the bottom of the pot, no less than ¼” in diameter. To prevent soil erosion in your pots, line them with newspaper before you put your potting soil in. This will allow the excess water to drain out, while keeping the soil in. For your outdoor vegetable garden there are a number of solutions you can go with. For starters, build your garden beds up using raised beds. As vegetable gardening author Chris McLaughlin writes in her book Vertical Vegetable Gardening: A Living Free Guide, raised beds give you better drainage especially in areas wher clay soil dominates. Many people that have raised beds, build them in such a way as there is no need to actually go into the bed itself and that helps by not compacting the soil every time a step is taken near their vegetable plants. Finally, whether you are using raised beds or not, mix up a soil solution that aides in wicking away excess water. There are three great products that you can add to your soil before you plant that will help with this. They are peat moss, coir and perlite. The peat moss and coir are interchangeable. Although you can, you would not use them together as they serve the same purpose. They make your soil loose and friable. Peat moss is far less expensive than coir, and one distinct advantage coir has over peat to justify the price, is coir is more environmentally friendly as a renewable resource since it is derived from the fiber of the outer husks of coconuts. Peat moss, also referred to as Sphagnum (peat moss’ genus name), grows in dense masses on boggy ground. Peat bogs are valuable to wildlife habitat that rely on them. I was unable to locate any study findings as to how quickly or slowly peat regenerates itself once it’s stripped. You would mix either peat or coir with perlite though. Perlite is a form of obsidian (A hard, dark, glasslike volcanic rock formed by the rapid solidification of lava without crystallization) consisting of glassy globules, used in plant growth. Perlite helps loosen heavy soils (high clay content), aerate soil, prevent soil compaction, and aid in preventing overwatering. When it comes to perlite, a little goes a long way. So you do not need to add a lot to your garden beds. The combination of using raised beds along with items that aid in preventing over watering will help with reducing the potential of root rot on your vegetable plants. Is the word “Organic” losing it’s meaning? How do you Stake your tomatoes? Grow Your Best Peppers Yet!